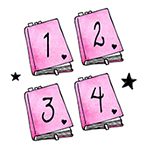 The Very Pink Notebook is thrilled to be part of T.A. Cotterell's, What Alice Knew, blog tour this week. With much thanks to Becky Hunter for involving me in the tour and for a copy of the book. The opening line of this book is brilliant. It wasn't until the end that I realised it's significance to the novel as a whole. It is a perfect and clever summarisation. 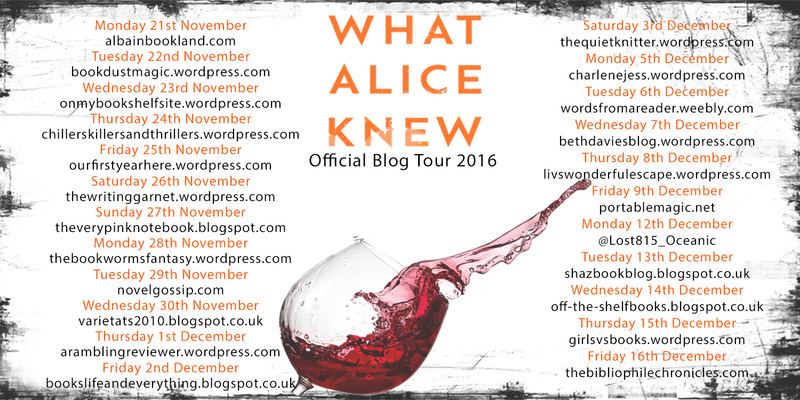 What Alice Knew is a thriller of unusual proportions. Stepping away from the 'who done it' chase, it instead looks at the grimy aftermath and the damaging and lasting effects on a couple when one has committed a crime. Thrust into the world of Alice and Ed, one a creative portrait artist with an almost compulsive obsession with searching for the truth in people and pulling out the 'honesty' in them through the art she produces, the latter a highly regarded and decorated obstetrician, who finds himself thoroughly adored by colleagues, friends and family alike we soon find their, almost too perfect life, smashed to pieces by a series of unfortunate events resulting in an untimely death. We see events through the eyes of Alice. We are taken on a journey with her through the series of emotions she feels on initial discovery of the incident, her take on events, her feelings about her husband and family, her decisions on what to do with the information she has, the knowledge she has about the type of person her husband is. But, Alice soon realises, perhaps she doesn't know what she thinks she does and really it becomes a case of what Alice doesn't know rather than what she does. I have to say, I did not like the character of Ed and suspect he had a touch of the God-complex, a side effect of his job and the constant adoration he received because of it. His initial remorse too quickly dissipates to almost arrogance - as he is constantly told by Alice -and believes himself, what he adds to life and the community, his impeccable character, his life-saving skills as an obstetrician, his wonderful relationship with their children, are worth more than admitting to something that although he maintains was an accident, would land him in a lot of trouble. However, as Alice discovers little things that don't add up she finds herself questioning everything she thought she knew about her husband and I wanted to urge her on to keep digging, and of course her natural instinct as a portrait artist (see that first line of the book!) means she does, leaving the couple testing the strength of their marriage and relationship to the max. Cotterell has used his extensive knowledge of art history and theory a lot throughout this book. It works in seamlessly well and supports the plot entirely. The author has written a complex, emotional story from quite a unique perspective and the ending is in complete unison with this. I thought it was a brilliant and wholly fitting conclusion for Alice, perfect for her character and not as straight-forward as may first seem, just like everything else this novel. As debut's go, T. A. Cotterell has nailed it with 'What Alice Knew', it is a gripping and meaty book that is a must read for anyone that loves a domestic psychological thriller. Tomorrow I hand over the baton to www.thebookwormsfantasy.wordpress.com.